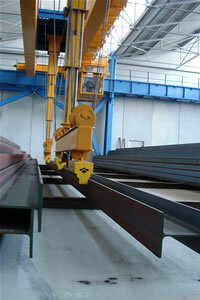 Material handling of structural steel and plate for fabricators has been considered a necessary evil for years. Not because it is totally unnecessary but rather it never adds value to the process! Material handling systems have helped greatly over the years to reduce the amount of handling, but the required usage of overhead cranes will always be a major component of fabrication. The use of permanent magnetic lifting systems for plates and structural steel have proven in Europe to reduce the cost associated with this type of handling by over 50%! How many times have you watched a crew of two or more workers in your shop attempt to pass chains under a section or plate only to start to make the lift and then realize that you have to move the chains to center the load? Once the effective mid-point is determined for lifting, you watch one or two of your workers steady and walk the section from one area of your shop to another. 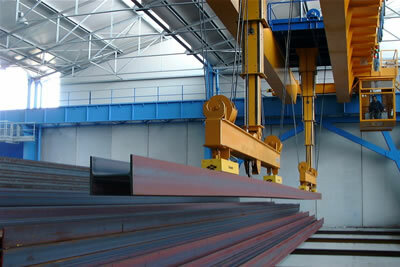 As the steel is about to be lowered, blocking must be located and placed under the load to separate this from the prior plate or member to provide clearance to hookup for the next required move. This proven system of permanent magnetic devices eliminates the need to require blocking under the material for future lifting as well as the additional labor required when using chains for lifting. This unique lifting system features a permanent magnet so it is not necessary to have a battery powered backup to maintain the magnetic force in the event of a power failure. This system uses power only to reverse the polarity to release the material when it is resting securely on the ground. The typical system for handling plates features a hydraulically powered telescopic design that positions the magnetic lifting elements outward depending upon the length of the plate to be processed. 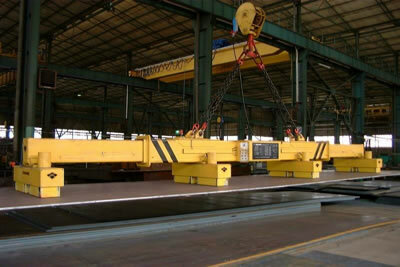 Plate in length up to 40 ft. can be processed with this system. How much time does your workforce spend over a year placing blocking under each structural member, running chains under a member and hooking up to the crane, walking the section as it is moved in your shop and then performing the same task again in reverse? If you start to run the numbers, you will quickly conclude how much this part of your handling adds unnecessary cost to your operation. This permanent magnet system permits sections to be lifted and moved without slinging chains, working with blocking and steadying the member as it moves in your shop. Easily your productivity is increased by up to 300% while using fewer employees for this task. The versatility of this system even permits the ability to rotate sections without your employee having to come into direct contact with the member for added safety.